Vanilla is one of the most well known scents. The oil has a rich, sweet, vanilla odor. Vanilla is a perennial herbaceous climbing vine that can grow up to 25 meters (82 feet) high and that is native to Central America and Mexico. In cultivation the deep trumpet-shaped flowers of the vanilla must be hand-pollinated; while in Mexico the native humming bird do the work. The green capsules or fruit are picked, cured, and the immature vanilla pod or bean is fermented and dried to turn it into a fragrant brown vanilla bean. Vanilla oleoresin is considered a premiere sensual aphrodisiac and one of the most popular flavors/aromas. It is comforting and relaxing and is also an ingredient in Oriental type perfumes. After civil wars and reduced availability, the price of vanilla essential oil has risen to the point of most absolutes. Nonetheless, the true oil is recognized as being well worth the price. Mexico is credited as its first cultivators of vanilla bean. 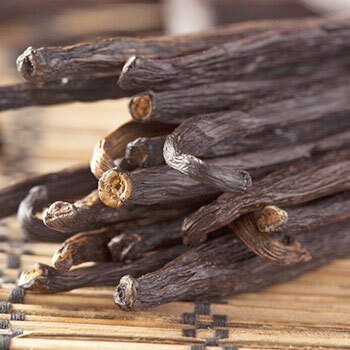 In the 1400's The Aztecs showed the Spaniards how vanilla could sweeten their chocolate and perfume their cigars, and the long, dark vanilla beans became part of the Spanish empire's rich colonial trade as early as the middle of the sixteenth century. No known toxicity. Avoid high concentration in pregnancy.